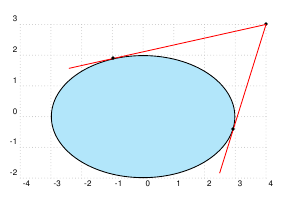 I'd like to create an ellipse (using psellipse, say). Call it E. And I'd like to specify a point P outside E. And then I'd like to construct, using PSTricks, the two rays starting at P and tangent to E.
I know I could do this by doing it for a circle and then "stretching" the picture to make it an ellipse, but that complicates other things I'd like to do. And of course one could figure this all out using explicit computations. But I'd like to know if there is some simple straightforward way. 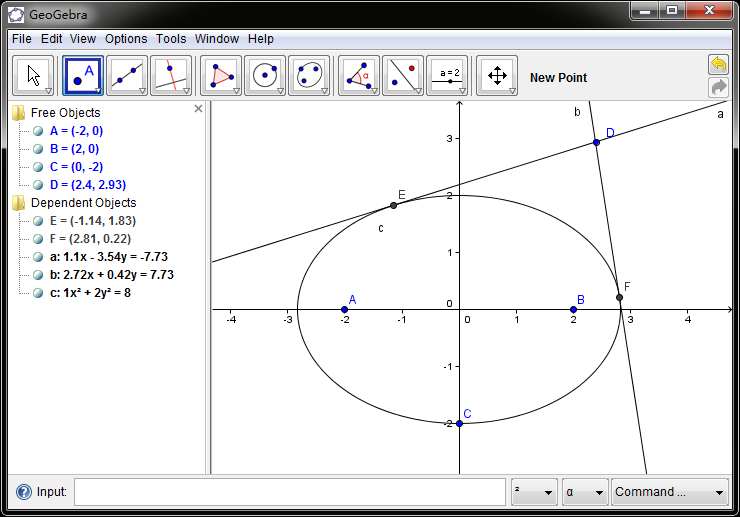 I advise you to use GeoGebra to draw such Euclidean Geometry graphs. It has a friendly GUI and can export PSTricks code easily. You may want to have a look at the pst-eucl package. How can I draw a landscape picture using PSTricks? Creating figures of polytopes (in 3D): Is it worth switching from PSTricks to TikZ? Pstricks (Latex Draw) and Transparency are clashing? How does PSTricks determine the final path direction of composite objects made by \reversepath?